Recently, although British Sea Power have not until now appeared on the music project, I’ve developed a taste for their music. Some time recently, possibly 2012, there was a thing on the BBC called Storyville: From the Land to the Sea which, to keep short, was a montage of old seaside footage from the BFI put to music by British Sea Power. So I went off and downloaded what I could using the crap rural internet I have access to and began to educate myself in the chronology of British Sea Power. The band have connections to the Lake District and Brighton and their style is kind of a cross between Elbow, Kaiser Chiefs and Blur. They’re quite quirky and definitely British; You can just tell. 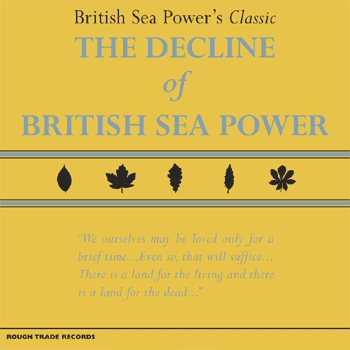 The album Decline of British Sea Power is their first. As an introduction to the band Decline is probably not a good place to start. It’s as though they’re still to find their own unique style and are appeasing the mass populace with the selection of tracks here. To quote New-Mrs-Gnomepants when hearing track 2 Apologies to Insect Life: “This is a racket”. However their rusty sea washed iron and rolling sea sound does come out in a number of tracks too. If I ever get round to making my epic round coastal Britain television-documentary, I’d certainly use British Sea Power to provide the soundtrack.